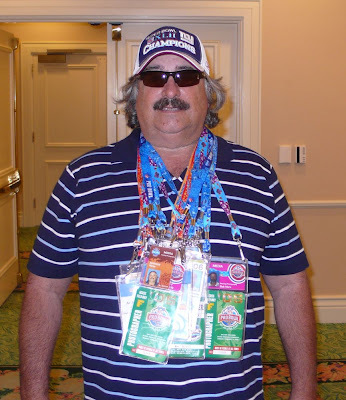 This photographer stopped in to see our badging crew for his Pro Bowl media credential. It was cool to see he was wearing credentials we had produced for this event in other years. His bling definitely makes him the Mr. T of Credentials. Do you need credentials produced? 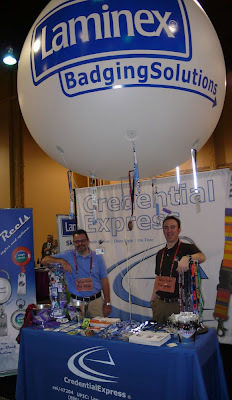 Check out www.credentialexpress.com for info. I guess you could say life is good under The Laminex Family of Companies Big Balloon. Call us anytime for samples and pricing. Oh, you need a catalog? Visit CredentialExpress.com to download a PDF version here. For those would-be-criminals wishing to exploit the somewhat new technology of RFID, watch out. California's new SB 31 law has teeth! This new law is meant to deter those who would knowingly skim information from RFID cards and chips. This process is protected on some financial cards and access credentials through a process known as mutual authentication, but some other cards and credentials remain largely unprotected. Effective January 1, 2009, the new law states that prosecuted "Skimmers" would be subject to fines and imprisonment of up to 1 year in a county jail. Good for California. Good for the financial institutions. We say: Why not proactively protect yourself and your personal data by using an EOS, or Electromagnetically Opaque Sleeve like the SkimSAFE? They're ready for use now, and easy to deploy. Just slide the card in and you're safe from the skimmers. Read more about these innovative devices here. We stumbled across this Spy Cam Photo ID Card kit. Is it us or would it be a little awkward to make sure your fake looking ID card is always facing the action?